Large bulk carrier ship passing under the expansive Ambassador Bridge from Windsor to Detroit, Mich. 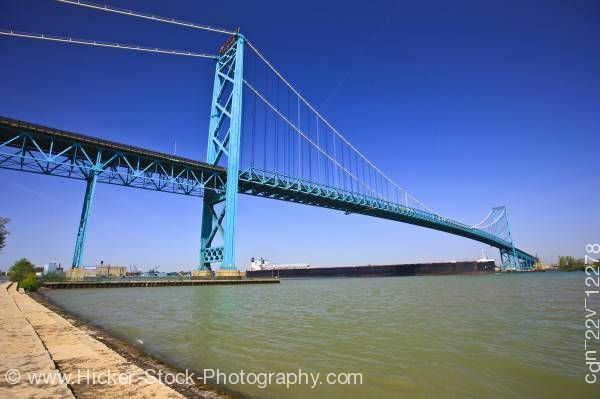 This stock photo showing a large bulk carrier ship passing under the Ambassador Bridge, which expands over the Detroit River. The sky is a clear bright blue. The foreground shows a cemented walking area and the river to the right. The river casts a relaxing green color and a wonderful contrast to the light blue color of the bridge. The bridge spans the river from Windsor, Ontario, Canada to Detroit, Michigan. The ship is a large, black freighter. They are used to carry cargo from one port to another. Usually made of steel and their life expectancy is around 30 years. Windsor is the most southern city in Canada and is also known as the City of Roses. Large bulk carrier ship passing beneath the Ambassador Bridge which spans the Detroit River between the cities of Windsor, Ontario, Canada and Detroit, Michigan, USA.